Sree Nataraja English Medium High School was established on 1997- 98 in Mysore with a commitment to provide for poor and middle class students in and around Mysore. Now the school has carved a distinct niche for itself among such schools in the city with over 200 students at present studying in different classes. English is the medium of instruction. Hindi, Kannada and other Indian languages will also be given due importance as prescribed by Government of Karnataka. English, Kannada, Hindi, Mathematics, Computer Eduction and Social, Physical and life sciences will form the mainstream subjects. The institution stands for certain basic values such as tolerance, co-operation, sharing, solidarity service, peace and love. We expect our students to be embeded with these values and manifest them in their actions. At present the school is headed by Sri. 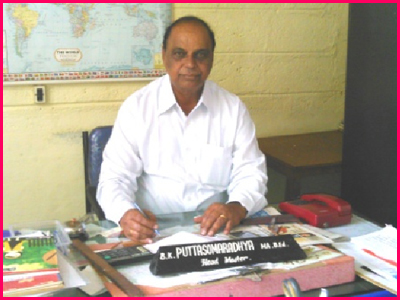 B. K. Puttasomaradhya, a post-graduate with rich and rewarding experience in teaching and managing the school. He is heading a dedicated team of well qualified and experienced teachers. Students are instructed to bring the school diary daily to class everyday. Parents are suggested to inspect the diary regularly for remarks. In the absence of the father, pupil may produce mother’s signature. Do not disturb the teachers when they are in the class. 1. To see that their wards attend classes regularly throughout the academic year. 2. To see their wards wear clean uniform and attend classes on all working days punctually. 3. To insist on their wards to listen to the advice of the teachers. 4. To encourage their wards to participate in all curriculum activities, celebration of functions. 5. To call on teachers only after 4.00 p.m.
6. To contact the Head Master, if there is any suggestion to make or any point to be clarified. 7. To see that the wards attend school on the very first day of 1st and 2nd term. 1. Be in the school campus at the time prescribed and attend the assembly without fail. 2. Commit to memory the Nadageetha Song and the National Anthem and sing them effectively. 3. Not to leave classroom/school premises during working hours without prior permission. 4. Keep their classrooms and school premises always clean and attractive. 5. Observe order and silence at all times during working hours. 6. Avoid bringing valuable articles or money to the school. 7. Mobile phones are strictly prohibited. 8. Maintain their textbooks and notebooks etc., in good condition. 9. Not indulge themselves in any kind of agitation or antisocial activities. 10. Not buy eatables from vendors around the school. 11. Boys hair should not belong fancy hair styles. 12. Girls hair should look well, modest and be plaited. After each evaluation programme in July, September, November, and January, parents will be notified of the date of the Parents-Teacher meeting. All students should attend classes on all working days, even on special occasions wearing the prescribed school uniform. Grey colour shorts and white colour shirts on Wednesdays. Fee will be as per the norms prescribed by the competent authority, Government/Management. Fees will be accepted in the school office from 9.30 a.m. to 10.00 a.m. on all working days. There will be two comprehensive tests and two examination during the academic year. Tentative dates for tests and exam for all classes and subjects to change according to the critical situation. At the end of each test – examination, progress reports will be issued to all pupils. Our school has already sent 13 batches of SSLC students with many distinction and toppers. Our school provided a spacious play ground, Yoga classes are also arranged last year our school bagged 35 %. We have good library having more than 1000 books and a good science laboratory provided all the facilities to the students. Science and social study club is also provided. We have attended in all co-curruculum activities both at school level and at inter-school level bagged many prizes. Our school children have participated in the sports activities organised by the south zone of education department and also bagged many prizes. @ Copyright 2013 Sree Nataraja High School. | Powerd by : Teclore Technologies Pvt.Ltd.